Happy Meals. Golden Arches. 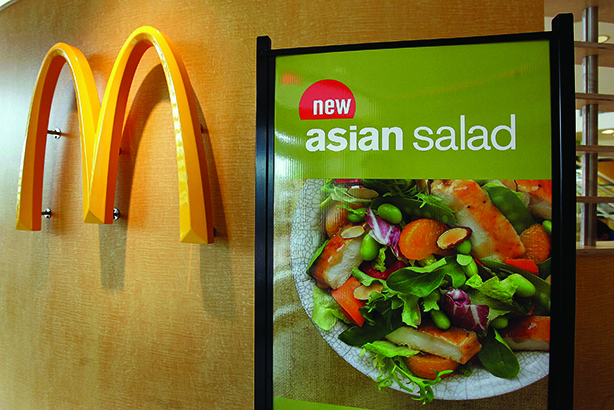 McDonald’s has been part of American culture since 1948, but to attract consumers in an increasingly health-oriented market and reverse recent revenue slides, experts say the fast-food brand must focus on consistency and transparency. In May, McDonald’s freshly minted CEO Steve Easterbrook announced a turnaround plan to focus on the chain’s "future as a modern, progressive burger company" by building brand excitement and cutting costs. As part of the strategy, McDonald’s named Silvia Lagnado, most recently CMO at Bacardi Limited, as EVP and global CMO. It also hired Robert Gibbs, founding partner of The Incite Agency, as EVP and global CCO. He replaces Bridget Coffing, who is retiring, in the role. Easterbrook says the company will put more emphasis on sourcing ingredients and reformulating recipes. He didn’t, however, explain the strategy behind improving food quality. Jack Russo, senior analyst at Edward Jones, says McDonald’s has made strides in becoming healthier and more open about its food, such as its plan to only use chickens raised without antibiotics within the next two years. "There’s a lot of cynicism about the ingredients and healthiness of the company’s products, so McDonald’s is trying to be more transparent," he adds. "It needs to continue doing that." A reason for distrust among consumers is the lack of consistency among the company’s comms and marketing efforts, says Fred Haberman, CEO of Haberman, which has worked with brands including Annie’s and Earthbound Farms. In January, McDonald’s launched an ad "basically slamming kale," and now the chain is testing a kale bowl in Southern California, he adds. "If the brand really wants to revamp its image and is sincere about providing food that’s good for you, McDonald’s needs to have a more unified marketing strategy that shows commitment," Haberman says. It should start paying more attention to the local food movement, he adds. McDonald’s released an ad in March featuring the small town of Petaluma in Northern California and wound up facing backlash for misleading the public with the term "local." The commercial referred to the brand’s breakfast sandwich as having "fresh grilled egg whites" and said, "lovin’ is local" at the end. While the store is locally owned, the ad has no mention of sourcing in Petaluma, which is predominantly a rural farming town, notes Haberman. The brand should create pilot programs and partner with farms and community organizations to start locally sourcing food, he says. "We want McDonald’s to be a force for goodness and it has that opportunity, but it’s not something it can boast in three, six, or even 12 months," Haberman adds. "McDonald’s needs to give it some time and communicate once it has positive results." The chain should always be experimenting, says Bill Power, global head of the brand marketing practice at FleishmanHillard, and should put a lot of attention on what’s behind the counter. "The food chain is not just about safety – it’s also about quality," he explains. If the brand proves itself in the coming months, Haberman says "Millennials could be the fast-food chain’s greatest communications asset on social media and through word of mouth." On the competitive front, Russo says several made-to-order chains, including Shake Shack and Five Guys, are "nibbling at the heels" of McDonald’s. "It sees success in some of the small brands and there’s no reason why McDonald’s can’t emulate that," adds Russo. Power sees nothing wrong with learning from the competition, but believes McDonald’s should stay true to its heritage, "reinforcing its core differentiator and value proposition, which is fun." "It has to address serious issues while at the same time maintaining a whimsical tone and attitude because, at the end of the day, that’s McDonald’s," he says.